As noted in the TLC High School Google site in Projects” vs. Project Based Learning’s What’s the difference or are they the same? Projects done in school are usually the result of learning students have done. The typical approach is to learn about a topic through readings, worksheets, direct teacher instruction, then to create a project that demonstrates the learning that has occurred through the unit. Project Based Learning is an approach that guides the learning, through driving questions and student inquiry, to uncover or discover the information needed to answer a question, solve a problem/mystery, or invent/create something new. In Project Based Learning, the project is not simply the visible result or culmination of the learning, but rather the cause of the learning. Does the educator have a deep understanding the philosophical principles and theoretical underpinnings of the instructional strategy? Is there an authentic and relevant context directly related to the students’ lives? Does the educator incorporate student voice and interests in its conception and development? In its implementation, do the students have permission and freedom to go in a direction that interests them? In its implementation, does the teacher fade into the background with students coming into the foreground of thinking, doing, and discussing? Are there the venues, space, time, strategies for reflection so students can construct their own meanings and understandings? In order to use any instructional technique effectively, the teacher needs to understand the fundamental principles and assumptions upon which the specific technique is based (http://www.adprima.com/strategi.htm). Educators should go through a process of learning, understanding, and articulating the theory and guiding principles of a new teaching strategy-framework when considering the use of the strategy in their own classrooms. Free and accessible content on the Internet provides educators with a variety and full range of opportunities to learn about the instructional strategies being considered for implementation in the classroom. The topics, content, and processes being introduced to students need to be relevant to the students themselves. It needs to have a context within their lives. School curriculum often presents content in these bits and pieces of facts and knowledge that are un- and disconnected to anything related to the students’ prior knowledge and life experiences. Because of this disconnectedness, this content often floats away. A relevant, current, and timely context provides students with the stickiness needed to make the content relevant, deep, and long lasting. Without meaningful context and sensible processes, learning can become, well, merely academic. The learning system of the 21st century must be designed to deliver the right content via the right processes in the right context. The definition of “right” is whatever gives learners access to their own skills, creativity, and success. What works today could be obsolete in six months, so we must focus on creating opportunities for self-generated, relevant learning that allows people to discover avenues for self-empowerment in the future (http://www.fastcompany.com/73376/how-learning-relevant-me). 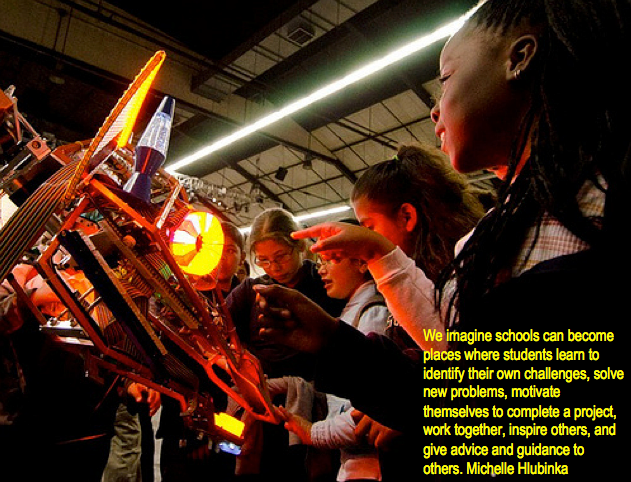 Project-Based Learning and Maker Education, when effectively implemented, have the potential to establish relevancy. Hands-on, experiential activities, the uses of all senses, a sense of play and fun, and immediate and authentic feedback are natural elements of these instructional strategies. They are multisensory, multidisciplinary, and multidimensional increasing the chances to be seen as relevant by the students. Why? Why are we studying this? How are today’s content and activities tied to the other areas of one’s life? What should I know or be able to do after today’s class? How can the information and skills be used in everyday life? Add to this mix student voice and choice (see next section), then relevancy can be almost assured. Does the educator incorporate student voice and interests in curricular conception and development? If the educator develops the guiding questions, the methods of exploration and inquiry, and the expected outcomes, then it is the teacher’s project not the students’. The students still may be interested in the lesson, but the ownership is still that of the teacher. As both PBL and Maker-Education are process-oriented instructional strategies, these questions should be re-visited throughout the process by the students to see if they need to be changes, revised, or re-generated. PBL and Maker Education entails the educator becoming a tour guide of learning possibilities; showing the students the learning opportunities and then getting out of the way. This translates into letting go of expected products or outcomes; letting the learning process naturally go in the directions that students take them; expecting and embracing failure as learning opportunities; and listening to and validating student suggestions. Another one of my beliefs about good education is that the students should be doing more talking, doing, and thinking than the teacher during instructional time. This literally means the educator becomes the guide on the side and the observer from the back. Students naturally emerge as co-learners and peer tutors as the PBL and Maker Education learning activities evolve when they given the permission and freedom to do so. PBL and Maker Education, when done “right”, become discovery-based learning leading to students constructing their own understandings and meaning. It is a constructivist approach to learning. Incorporating reflection into the instructional process with the goal of articulating learning insights helps insure that learning is not left up to change. Moon points out the conditions for reflection include time and space, a good facilitator, a supportive curricular, and an emotionally supportive environment (https://sites.google.com/site/reflection4learning/why-reflect). It needs to be intentionally built into the curriculum and as with all aspects of instruction, student voice is the primary voice during the reflection process. To read more on the reflection process, visit Where is reflection in the learning process? Awesome post by @jackiegerstein with #pbl info. Must read! Jackie: Thanks for this inspiring and clearly articulated post about PBL. I agree with your sentiments, but struggle to incorporate authentic projects within the framework of a state mandated curriculum that ends in a state mandated test. Any suggestions?? Thanks!